Governor Andrew M. Cuomo today announced Pitch NY, a workshop to provide aspiring filmmakers, producers and writers from across New York with resources and advice and connect with industry leaders to advance their careers. The event, hosted by the Governor’s Office of Motion Picture & Television Development and NBCUniversal Studios in collaboration with the National Hispanic Foundation for the Arts, is the latest of New York State's initiatives to promote the inclusion of diverse voices in the entertainment industry. "New York is the cultural capital of the nation with a proud history of equality and diversity," Governor Cuomo said. "By connecting students from diverse backgrounds with leaders in film and television production, we are proud to be helping to foster the next generation of New York innovators and creating a stronger, more inclusive entertainment sector in this state." The Governor’s Office of Motion Picture & Television Development works closely with studios and non-profit organizations to cultivate New York State’s homegrown talent and help build and expand pathways for aspiring content creators. In order to participate in the inaugural Pitch NY workshop, students interested in careers in the entertainment industry were selected by the National Hispanic Foundation for the Arts. The thirty-one student participants that were selected are undergraduate, graduate and recent alumni who hail from geographically diverse areas across New York State and represent a combination of public and private universities. A day-long interactive workshop, Pitch NY featured two informational panels, a breakout "speed dating" pitching session, and a marketing competition. The event was held at NBCUniversal's 30 Rockefeller Plaza studios. Photos from the event are available here. New media experts from Vimeo, Vice Media and Seeso, part of NBCUniversal, discussed industry trends and provided students with insight into the innovative and evolving content creation and distribution structure in a post-cable world. Representatives from Marvel, the Black American Film Festival, Universal TV and House of Cards provided advice and personal anecdotes to teach students how to advance their stories and break into the industry. 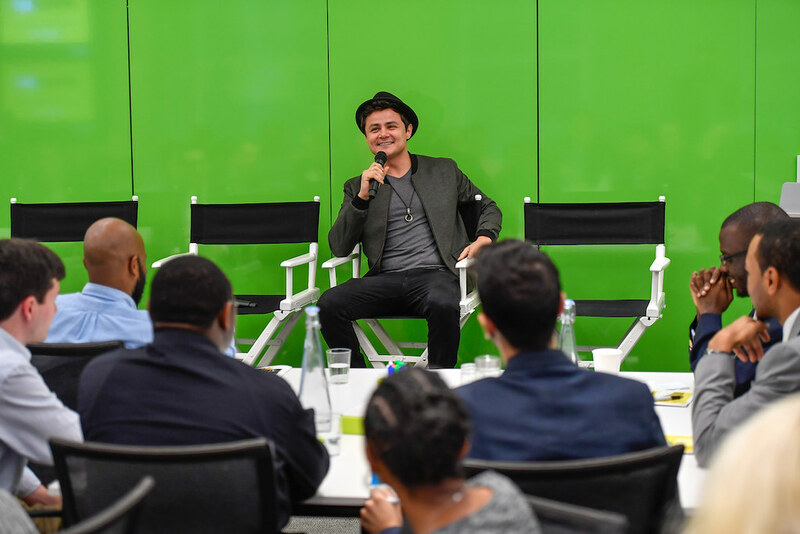 Actor Arturo Castro, known for his work in Comedy Central's Broad City and Billy Lynn's Long Halftime Walk, joined the event to share his rise to fame and offer advice on how to entertain across all platforms. Participating students were paired with producers, developers and writers from Lionsgate, CBS, Warner Brothers, Sony, Fox, FX, Shades of Blue, Night Of, DeFina Film Productions, HBO and House of Cards. In these one-on-one sessions, students practiced their story pitches and received feedback and constructive criticism from industry leaders. The industry representatives simulated real-life pitching situations and gave students an opportunity to share their stories and enhance their pitching skills. These "speed dating" pitching sessions also connected entertainment industry leaders with a rising generation of diverse content creators. Pitch NY students were also offered the opportunity to work with Empire State Development’s marketing team as part of a statewide marketing campaign. Students will be able to present story ideas for promotional New York State videos with the goal of highlighting New York’s longstanding role as a national leader in the fight for freedom and social justice and its connection to economic development. If the pitch is successful, students will be awarded $1,000 to produce a social media short and have the additional opportunity to have their content displayed on state websites as part of this statewide marketing campaign. The top winners will also receive a $5,000 grand prize for their work. Felix Sanchez, Chairman and Co-founder, National Hispanic Foundation for the Arts, said, "PitchNY is a groundbreaking opportunity for New York college students to present their story ideas to entertainment professionals from diverse media platforms. PitchNY is yet another major public/private partnership committed to greater inclusion in the entertainment business." The New York State Governor's Office for Motion Picture & Television Development, a division of Empire State Development, offers film, television and commercial productions and post production tax credits for qualified expenditures in New York State. The office also serves as a liaison between production companies and city and local governments, state agencies, a network of statewide contacts, local film offices and professional location scouts and managers. For more information on filming in New York State or the Film Production and Post Production Tax Credit Programs, please visitwww.nylovesfilm.com. Empire State Development is New York’s chief economic development agency. The mission of Empire State Development is to promote a vigorous and growing economy, encourage the creation of new job and economic opportunities, increase revenues to the State and its municipalities, and achieve stable and diversified local economies. Through the use of loans, grants, tax credits, and other forms of financial assistance, Empire State Development strives to enhance private business investment and growth to spur job creation and support prosperous communities across New York State. Empire State Development is also the primary administrative agency overseeing Governor Cuomo’s Regional Economic Development Councils and the marketing of “I Love NY,” the State’s iconic tourism brand. For more information on Regional Councils and Empire State Development, please visit www.regionalcouncils.ny.gov and www.esd.ny.gov.